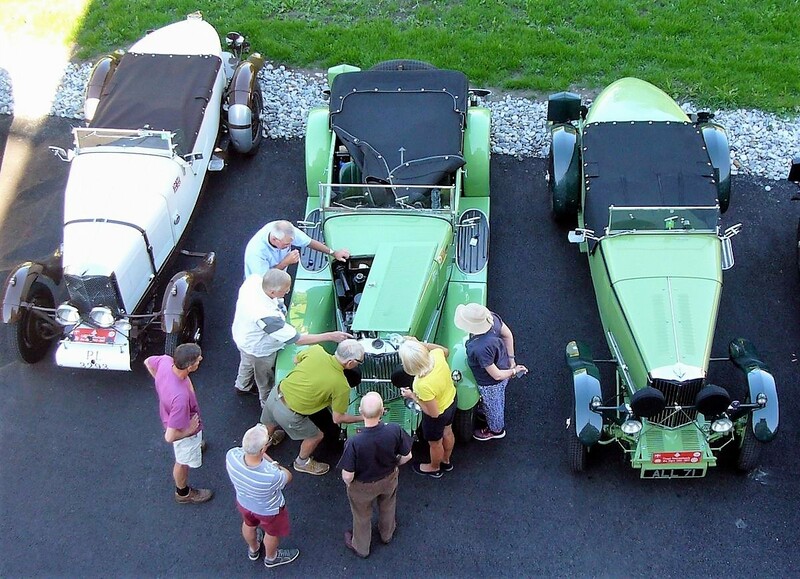 On the 1st July 2017 nine Talbot motor cars and eighteen intrepid Talboteers rendezvoused at the Hotel du Golf to the north of Reims. Under the leadership of David Thomson, they had come together to celebrate one of the most remarkable achievements in the long competitive history of Clement Talbot – the winning in 1932 of an Alpine Cup by a team of three standard Talbot 105s, without the loss of a single mark. We were graced to have two of the team cars in our number – David and Susann Cook in PJ 7363 and Des and Des Burnett in PJ 7362. As happened in 1932, PJ 7363 was being run in on the way to the start! That night the toast was to “absent friends” as Rob and Jenny May had recently had to pull out - their lovely Talbot being “hors de combat”. Day 1 took the party via the deserted roads of rural France to the edge of the Black Forest at Heitersheim. A canter up the Col du Bonhomme in the Vosges mountains was a taster of things to come. The next day took us through the “chocolate box” countryside of the Black Forest, followed by long miles on the motorways and tunnels around Zurich to the hauntingly beautiful glacial valley of Livigno in Italy. All round peaks soared to over 2000m. 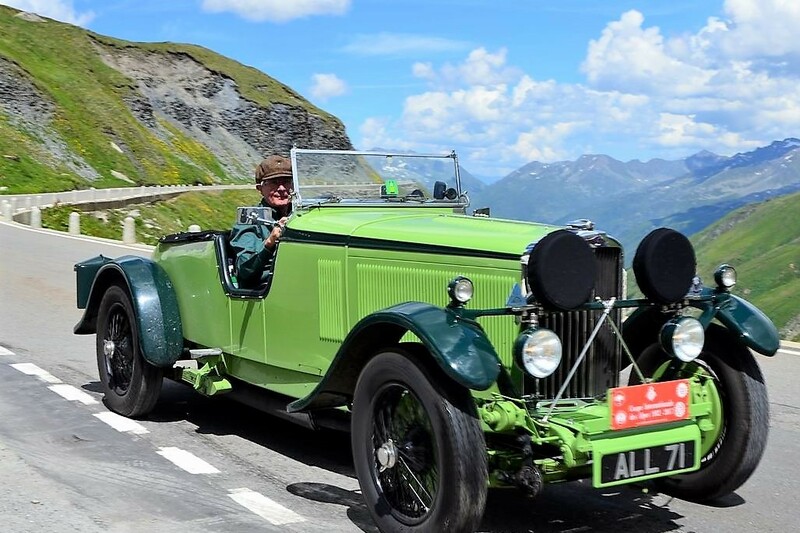 We were delighted to meet up with Fred and Tina in their Talbot, having made the short hop from their home in St Gallen. Alas, it was au revoir to Emile and Iky with a steering malady. Day 3 was a free day spent exploring the many 2000m+ cols that surround Livigno and revelling in fuel at less than 1 Euro per litre. The sun shone all day. Day 4 was a long haul to Meiringen in Switzerland. We had a lovely surprise when Heinz and Isobel Scholl arrived to join us for dinner. 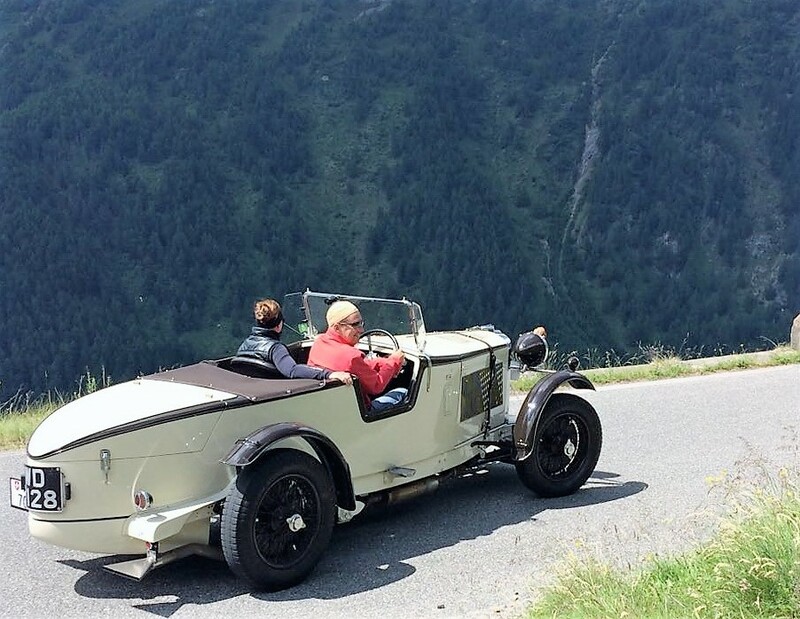 They had driven their Talbot over a couple of mountain passes from Lausanne and did the same to return home in the dark. Respect! Many took the fifth day as a rest day in Meiringen, enjoying following in the footsteps of Sherlock Holmes, walking in the hills or lolling by the swimming pool. Those who started their engines had an exceptional choice of mountain motoring in the near vicinity. Day 6 and we said goodbye to Fred and Tina. Most took a northerly route progressing through Switzerland and Italy to the Hotel Belvedere overlooking the French town of Bourg St Maurice. After meeting at the lakeside hotel in Chamouille in France the night before, an early start was made the next morning. Having found our way through Reims, our route took us across the Vosges mountains, over the Rhine near Colmar and into the Black Forest to our hotel in Heitersheim. The weather was dull and wet at times throughout the day. Suggestions were made for coffee and lunch stops but these proved to be unavailable, as, being Sunday, shops and cafes all seemed to be closed. Some of the group managed to find an ice cream shop and some interesting chocolate, but for others a couple of humbugs had to suffice! Eventually, after a long drive with wonderful scenery, little traffic and of course the occasional wrong turn, we arrived at Landhotel Krone in Germany. After breakfast al fresco in the brilliant sunshine at our hotel in Heitersheim, we motored through the glorious Black Forest to Switzerland. Forty euros later (for the Vignette), we took the motorway to Italy and en route stopped at what turned out to be an amazing restaurant with locally grown produce and enjoyed the most delicious salad. We made our way to Davos and over the enchanting Fluela Pass, the Bernina Pass (where we enjoyed a drink in the sunshine) and the Forcola Pass into Livigno, avoiding the keen cyclists and motor bike riders! We found the hotel and underground parking quite easily, but finding Reception and our room required several attempts! We all arrived safely, but unfortunately Emile's car suffered a serious problem and he and Iky decided to take the train back home to fetch his modern car and trailer and then drive back to Livigno to collect his car. They would then travel to Goumois and join us for our last dinner all together. After the planning had been sorted, we all enjoyed dinner together. Today was a free day as we were staying at The Baita Montana hotel for a second night. David had given us many options, including the mighty Stelvio, but as some of us had experienced the thrill of that particular mountain before, we decided to do our own thing. The morning dawned gloriously sunny again and, as this hotel has a rather wonderful underground car park, the boys were soon to be found doing a bit of fettling and tyre kicking. We were disappointed for Emile and Iky van Thor as it was judged that their car would not be returning home under its own steam. Late morning saw our party, Martin and Hilary, Rowland and Janet and Roman and Helen driving out of Livigno for our own adventure. We headed south west through Pontresina, then drove past St Moritz to where we thought would be a good spot for a picnic, but gave it the thumbs down, although the local supermarket ensured that we had ample supplies. Undeterred, we set off for Tiefencastel and before long we found a grassy bank which provided a great viewing point for our picnic. We returned home via the Albula Pass, then back through Pontresina. This being Day 3 we had become accustomed to some spectacular views and sights but our return journey continued to thrill us with the panorama. Refuelling with duty free fuel in Livigno saw us returning to our hotel well pleased with our day’s excursion. Another delightful evening was spent in the hotel, with an excellent meal and many stories about how wonderful the cars are and what marvellous opportunities they afford us. Day 4: Livigno – Meiringen, Tim Palmer and James Tibbitts. Another bright and sunny day dawns. The suggested route was much debated last night; out over the Bernina then Maloja, Splugen, St Gotthard and Susten is our leader’s plan; but an alternate northern route is gaining favour; out over the Bernina then Albula, Oberalp and finally either Susten or Furka and Grimsel. For us with a slight overheating issue avoiding the top of the St Gotthard sounds good and off we set quickly meeting up with Fred Herzog and Tina Hainz who know the way and we fix ourselves firmly in their wake, or as firmly as we can. We pass our leader and the Mohrs lunching at a café amid a set of roadworks between Flims and Andermatt and we press on to find lunch in a quiet hotel beside the road, where Fred and my co-driver Tim Palmer indulge in a local speciality, the description of which we were told simply did not translate into English, but seemed largely based on cheese and designed to deliver a full day’s calories on a single plate! On to Meiringen where the first spots of rain begin to fall shortly after we arrive. Not so for those behind us who report being caught in a downpour; Hilary Bryant unable to persuade Martin to seek shelter beneath a garage canopy, or even to raise the windscreen to provide some protection. At dinner it seems that we have all followed the northern route, and then the valiant Clive Kent arrives in his 90 having held true to most of the originally planned course, but at the cost of being caught in the early evening storm that threatens our al fresco dinner. We move inside as the storm passes us by and yet again enjoy a lovely meal. After five exhilarating days of hard driving, it was a welcome relief to take a break in Meiringen, a small, quiet and delightfully un-commercialised town close to the "Interlaken" lakes in the heart of Switzerland. The temperature had been rising for several days and we were now well over 30 deg and baking in the remorseless sun. Phew! We took the opportunity, as did most others, to do something totally different today. Some heretics even suggested a non-car day! Others talked about some exercise. We were of a like mind and, after giving the car a quick once-over and lowering the float level, we headed off for a leisurely stroll around town. We discovered St Michael's Church. The early medieval building had been devastated several times over the centuries by floods and rock slides, each time being rebuilt on a higher level in an effort to protect it in the future. Following a recent archaeological dig, there is now an exhibition in the church's basement. Very interesting, but a bit more excitement was now needed, so we took the cable car up to the highest adjacent peak, the Planplatten (2250m) where we enjoyed lunch in the Alpen Tower, views over the town below, the surrounding Alpine peaks and even 150 miles across to the Jura in France where we would end our tour on Saturday night. Stunning! Coming down again, we got off the cable car and walked the last third of the mountain back down into Meiringen, where we joined the others over a cool and very welcome beer and chat about the day. James, Tim, Fred and Tina had climbed the slopes, some 14 miles of them, well above the house and waterfall where Sherlock Holmes and Moriarty met their ends. Others investigated the Conan Doyle museum and some even ventured into the local outdoor pool - very welcome on such a hot day. The only "fly in the ointment" was Rowley and Janet's puncture (they shared it - Rowley is very kind like that! ), but the tube was efficiently replaced by a local garage for 50 Swiss francs (according to Rowley, everything in Switzerland is 50 Francs!) and consolation was found, as is so often the case in Talbot circles, in the bar! A good day and Meiringen is definitely worth another visit." Yet again the talk is of northern or southern routes. On the promise of less traffic most plump for the former and marker pens fly across the maps. The early miles take us the entire length of the Thuner See, spectacular lake views alternating with tunnels. As we head into the scenic Simmental valley it starts to get twisty and steep – the Talbots are in their element. Coffee at Gstaad, the resort of the rich and famous, is aborted through lack of parking. Smaller Gsteig obliges and we are soon joined by a gang of enthusiastic Talboteers. Col du Pillon comes and goes as we flash past beautiful Aigle and its vineyards. Verbier to the left, some terribly congested tunnels and suddenly we are climbing the Col du Grand St. Bernard. It is the climb of the day. At 2500m we crest the snow line and revel in the cool air, but the water temperature gauge does not permit us a stop. Briefly into Italy—the Aosta valley is as hot as Hades – Martin sees 44 degrees on a shop thermometer. With car and occupants gasping, we throw ourselves at the Col du Petit St. Bernard. At the top a cold beer, in the company of the obligatory St Bernard dog, tastes sweet. Then through a series of ski resorts, before plunging down to the Belvedere Hotel, perched precariously above Bourg St. Maurice. More cold beers and wide smiles tell the story of an exhilarating day’s motoring. There were three routes suggested for the final day’s journey. The route chosen would be a challenging 245 miles following a thrilling section of the Routes des Grandes Alpes. 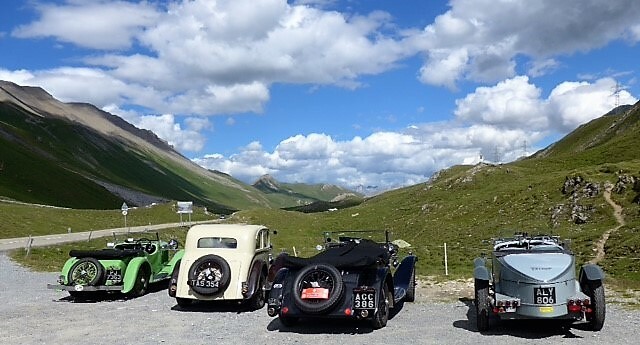 Challenging it was, as after about 65 miles and ascending the Col des Aravis a front wheel bearing problem brought DLR 73’s celebration of the 1932 Alpine Trial to a premature ending. After limping into La Clusaz and, despite the best efforts of RAC Recovery to arrange a hire car, sadly we could not join all the other Talboteers for the final celebration at Goumois. Returning the next day via TGV and Eurostar took nothing away from the invincible Talbot in alpine motoring. The ten Talbots that took part in this, the 85th anniversary of the 1932 International Alpine Trial, did it with style and flair.